Oldoinyo Le Ngai is a Maasai term meaning Mountain of God. This mountain is the only active volcano in East Africa. Volcanic activity on the mountain has been observed from as far back as 1883 up to date. Oldoinyo Le Ngai mountain reaches a height of approximately 9442 feet. Significance of the Mountain to the Maasai Oldoinyo Le Ngai is the sacred mountain of the Maasai. The Maasai go to the mountain to pray and offer sacrifices to God. Reasons for going to the mountain include sickness, infertility, and other misfortunes e.g. If a person loses his livestock. The Maasai who go to pray on the mountain take black flawless sheep which should not have reproduced and are female (young ewes) as sacrifices. The sheep are kept in a specific place on the mountain (a dry water hole), then the Maasai sing songs of worship and praise to God before sleeping. In the morning when the Maasai wake up they find the sheep gone and there are no traces e.g. bones or skin seen. The Maasai who take the sacrifices are not allowed to eat until they have left the mountain but those who have been to the mountain say that they wake up with full stomachs, belching meat and milk. The Maasai believe that God speaks to them on the mountain as they feel his presence and hear mysterious voices but do not see the person talking. The Maasai believe that a bad person e.g. a person who practices witchcraft does not dare to go to the mountain because God will strike them dead (The elders I spoke to say no such incident has happen because bad people do not dare to go to the mountain, as they fear God’s wrath). 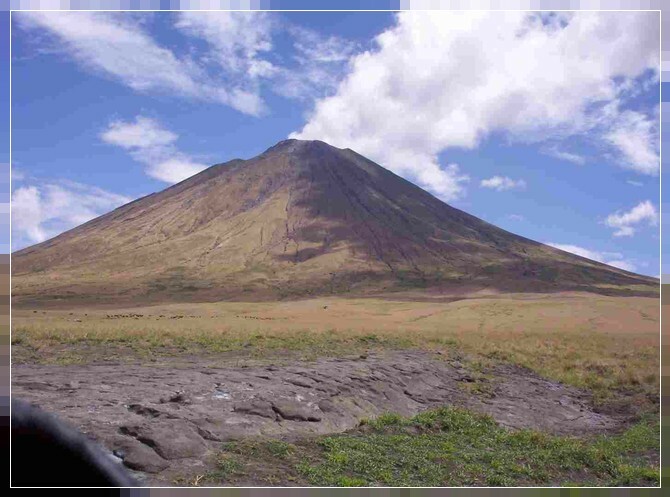 Another reason why the Maasai are awed by this mountain is because the soil keeps changing colour from white, gray, red, brown, black and even yellow (because of volcanic activity). One American explorer referred to this mountain as the “Big rock candy mountain” because of its varying colors. Oldoinyo Le Ngai is the most sacred place of worship for all the Maasai from the whole Maasai Diaspora in both Kenya and Tanzania. The Maasai from both countries come to pray and seek Gods intervention in the mountain of God. Climbing the mountain requires 4-5 hours moderate exertion. The ascent is quite difficult and challenging because the mountain is steep and climbers are exposed to the hot sun as there is hardly any shade.The best time to climb the mtoo hot. Herds of zebra, wildeountain is early in the morning before the sun gets beest. A trip to the mountain can also encompass othernearby areas of interest like Lake Natron, the lake is a breeding groufor flamingoes and other birds, there are several Maasai bomas (homesteads) which can bethe nearby Mount Gelai which has geysers and a spectacular waterfall.